Not everybody knows that painted walls can be “washed” just like other surfaces. It depends of course on the type of paint so it’s advisable to make a little test before. The general dirt (little handprints, splashes of dirty water, etc.) can be removed using a simple wet cloth. 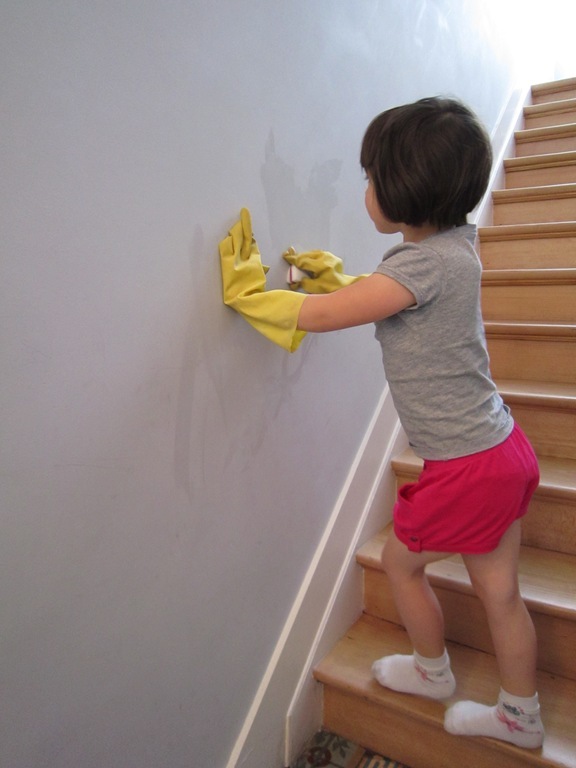 If you do it regularly, they will come up easily and your walls will look great all along. For scuffs marks and more resistant spots you can buy a Mr Clean Magic Eraser at every supermarket. It is really magical (it cleans everything!) and kids love helping out with it. Since it involves some dripping and the eraser material is not skin friendly, use plastic gloves. For a big walls cleaning, start by dusting from top down and then with a wet cloth (with some cleaning product) start cleaning from bottom up to avoid the dripping. You can work by small vertical portions of the walls and drying them before you move to the next. When painting your walls it is important to keep some spare paint that can be used for small “retouches” . You should also keep the paint colour code and producer so that you can re-order bigger quantities for the future.